Each player is given a secret goal card of one of the five colored dragons: RED, GOLD, GREEN, BLUE, and BLACK. 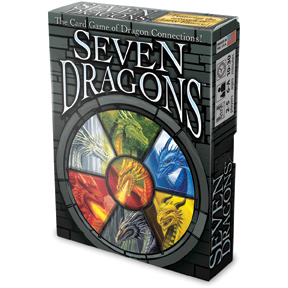 The cards are played on the table connected like dominoes, with each player trying to win by connecting seven panels of their dragon. Action cards allow players to shake up the action in five different ways and the WILD and SILVER dragons bring strategy to the table. The game is fast, fun, colorful, and easy to learn - with enough bluffing and strategy to keep adults engaged. Preschooler variations included for children as young as 3 years! 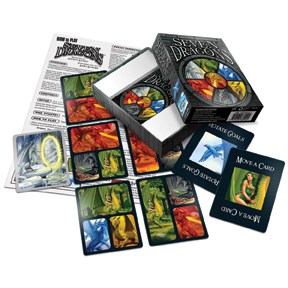 Seven Dragons, a game for the whole family. 3 Fun New Games for All Ages!